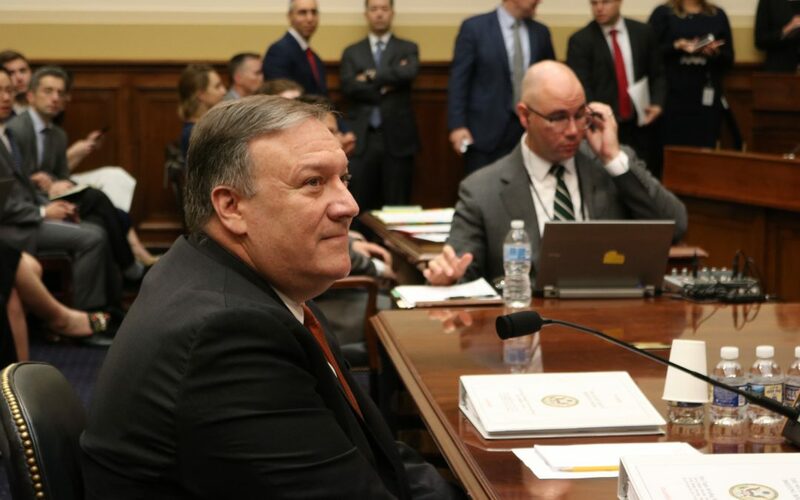 WASHINGTON – Secretary of State Mike Pompeo said Wednesday that his top national security priority is the denuclearization of North Korea, but whether the summit between President Donald Trump and North Korean leader Kim Jong Un occurs hinges on Kim’s willingness. “Our posture will not change until we see credible steps taken toward the complete and irreversible denuclearization of the Korean peninsula,” Pompeo told the House Foreign Affairs Committee in his first congressional testimony since being sworn in as secretary of state. But he also said that he is optimistic that the meeting planned for June 12 in Singapore will occur and hopes Trump will continue Pompeo’s meeting with Kim in North Korea last month. “(Kim and I) talked about mutual goals but there’s still a lot of places to find common ground…and I am hopeful for President Trump to continue that conversation,” he said. Kim threatened to cancel the meeting last week and Trump said Tuesday that there’s “a very substantial chance that it won’t work out” during his meeting with South Korean president Moon Jae-in. A number of congressmen raised questions about why negotiations with the North Korea, one of the world’s worst human rights abusers, have failed to raise issues on human rights. Pompeo could not guarantee President Trump would include in his deals with North Korea to advance human rights interests. “It (human rights) was mentioned during my conversation with Kim and it will be a part of the conversation moving forward…but we have broad outlines of what each country wants to do,“ Pompeo said. The secretary of state also advocated imposing “unprecedented financial pressure” on Iran following Trump’s decision to withdraw from the Iran nuclear deal. “We will apply unprecedented financial pressure, coordinate with our (Pentagon) colleagues on deterrence efforts, support the Iranian people, and hold out the prospect of a new deal for Iran – it simply needs to change its behavior,” he said. With the midterm elections coming up in November, Pompeo also defended the administration’s progress in securing a reliable election process safe from Russian interference. “I’m extremely proud of this administration – it’s light years better than what was done in the previous administration but there’s more work to do,” he said. He appeared before the committee to push for $39.3 billion for the State Department in fiscal 2019 — a significant cut from previous budgets. “The White House wants to cut $334 million as part of the so-called ‘recission’ package. How short-sighted is this request?” Rep. Eliot Engel, D-N.Y., asked.